“That was a great opportunity for us and all the guys, I am really thankful for the team to let us get up close and personal with the cars as this is something we never normally would have had the chance to do – and it is good to see them in the flesh after seeing them from up in the air,” said Major Andrew Mitchell. The on-track action was just as spectacular, with the support categories of the Coates Aussie Racing Cars, the Haymans Electrical Porsche Carrera Cup Series and the Formula 3 cars hitting the track in front of a crowd of 56,362 including 10,000 students in attendance for the official Student’s Day. In the Coates Aussie Racing Cars Paul Kemal qualified on pole position, before finishing second in this afternoon’s first eight lap journey, behind fellow Sydney-sider Nick Simmons. Gold Coast V8 Supercar driver Paul Morris qualified and finished in third position, Morris is also competing this weekend aboard his Supercheap Auto Racing Commodore in the Coffee Club V8 Supercar Challenge. 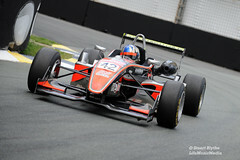 In Formula 3, John Martin was the stand-out performer, qualifying on pole ahead of James Winslow, before the Queensland went on to win the opening ten lap race by almost five seconds from Winslow. In the Haymans Electrical Porsche Carrera Cup recently crowned champion Craig Baird of the Gold Coast continued his great form of 2008 to snare pole position and win the opening race ahead of David Russell. The final moments of qualifying were marred by a spectacular accident involving Shaun Juniper and Bryce Washington. Juniper was finishing his last flying lap in qualifying as everyone else slowed for the close of the session, and just after crossing the finish line pulled to the left to avoid the slower cars. As he avoided one, he collected the wall on the left which sent him back into the path of Bryce Washington before the car travelled backwards to climb the wall and flip onto its roof. “When I realised what happened I had a closing speed in excess of 250 km/h so I just relaxed and tried not to panic as I headed straight towards Bryce,” said Juniper. “I hit Bryce pretty hard then mounted the kerb and rolled the car flat on its roof but I felt fine and pretty cocooned in the car. “I slid a couple hundred of metres along the tarmac and all I could hear was the tarmac wearing the roof away. Both Juniper and Washington were uninjured in the incident, and back surveying the damage to their respective cars shortly after. Tomorrow’s action will see the IndyCar Series hit the 4.47 kilometre Gold Coast circuit for the first time at 8.00am. The V8 Supercars will take to the circuit for two practice sessions and qualifying in the afternoon. With 96 hours of non-stop excitement over October 23-26 as the Gold Coast comes alive to the sound of the IndyCar Series burning up the track and Australia’s own V8 Supercars scorching around one of the most famous beach-side cities in the world, the event is the hottest ticket in town.